Can’t believe a year has come and gone already! Gonna make the one-anniversary party pop. For those who have been sleeping, The Payback is a monthly all-vinyl dance party brought to you by yours truly and a special guest DJ. Every 2nd Friday of the month, the Monarch Lounge gets to swim in four hours of sweet sweet soul, funk, and R&B. For the one-year anniversary, I had to have something special lined up. First off, I’m proud to have my man DJ Slopoke back on. Long time vinyl slinger, Slopoke is definitely an inspiration for a newcomer like myself. I had him on for Volume 7 of The Payback and everyone I talked to wanted him back. If you ever have a free wednesday, make sure to check him out over at Churchkey (Grant and Green) for his weekly DJ night called “Beer with Soul”. And Slopoke put me in contact with DJ Harry Duncan and the two of them are tag teaming the anniversary party. Harry D is a longtime Bay Area-based producer of live soul, funk, R&B, jazz, blues, roots reggae, African and World music shows. He has produced and hosted “In The Soul Kitchen”, the popular roots music show on KUSF, and KUSF In Exile, since 1984. The man is definitely a legend when it comes to knowing music and he’ll sure bring some rare, rare, rare cuts you’ll only hear at The Payback. Respected industry-wide as an innovator, Duncan integrates his years of experience as a live music producer, radio producer and host into the “Sounds Of Roots and Rhythm Project”. 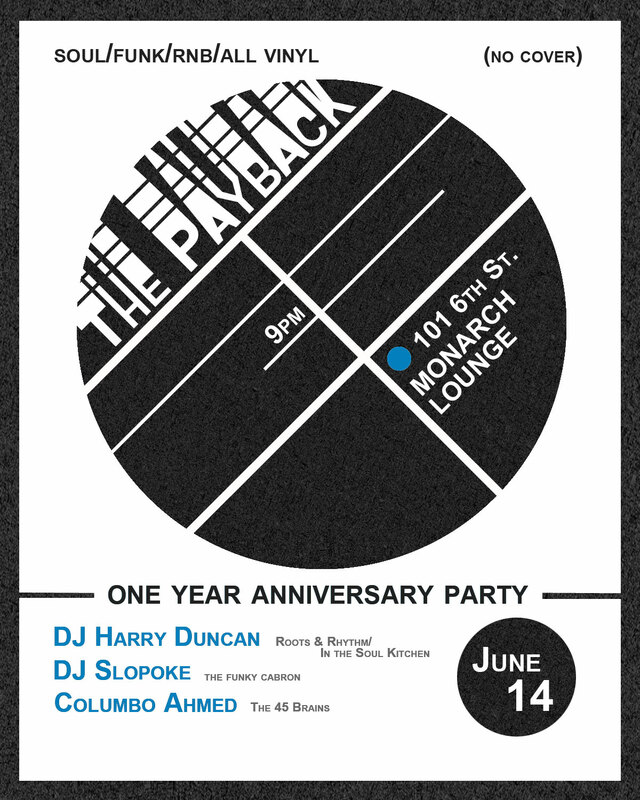 Thanks to DJ M3 and the good folks at Monarch for making The Payback such a special event. The drinks are always delicious and bound to get people off their seats.